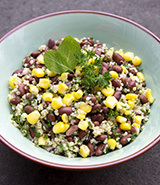 Place quinoa, corn and water in a sauce pan. Cover and cook for 15 to 20 minutes. Remove and fluff to cool. Combine oil, lemon juice, shoyu and black soybeans. Marinate 10 minutes. Mix quinoa, soybean mixture and remaining ingredients. Serve.